Zircon is a mineral belonging to a subgroup of silicate minerals called nesosilicates. 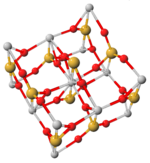 Chemically, it is known as zirconium silicate, with the formula ZrSiO4. Its natural color varies from colorless to golden yellow, red, brown, green, and black. This mineral is remarkable in that it is nearly ubiquitous in the Earth's crust and is among the oldest known minerals. It is mined for the metal zirconium, which is used in abrasives, insulation, and nuclear reactors. It is the source of zirconium oxide, an extremely heat-resistant material. Its crystals are seldom large, but relatively large specimens are valued as gemstones. Colorless, gem-quality crystals are popular substitutes for diamonds and are known as Matura diamonds. The name derives from the Arabic word zarqun, meaning vermilion, or perhaps from the Persian zargun, meaning golden-colored. These words are corrupted into "jargoon," a term applied to light-colored zircons. Yellow zircon is called "hyacinth," from a word of East Indian origin. In the Middle Ages, all yellow stones of East Indian origin were called hyacinth, but today this term is restricted to yellow zircons. Zircon is found worldwide as a common accessory mineral. Notable occurrences include the Ural Mountains; Trentino, Monte Somma, and Vesuvius, Italy; Arendal, Norway; Sri Lanka; India; Thailand; Ratanakiri, Cambodia; the Kimberley mines, Republic of South Africa; and Madagascar. In Canada, it is found in Renfrew County, Ontario, and Grenville, Quebec. In the United States, it occurs in Litchfield, Maine; Chesterfield, Massachusetts; Essex, Orange, and Saint Lawrence counties, New York; Henderson County, North Carolina; the Pikes Peak district of Colorado; and Llano County, Texas. Zircon is found in igneous rocks (as primary crystallization products), metamorphic rocks, and sedimentary rocks (as detrital grains). The average size of zircon crystals, as in granite rocks, is about 100–300 micrometers (µm), but they can also grow to sizes of several centimeters, especially in pegmatites. In terms of crystal structure, zircon belongs to the tetragonal crystal class. Hafnium is almost always present, in quantities ranging from one to four percent. Also, based on their uranium and thorium content, some zircons undergo metamictization. This process partially disrupts the crystal structure and explains the highly variable properties of zircon. Thorite, or thorium silicate (ThSiO4), is a related mineral with a similar structure. Commercially, zircons are mined for the metal zirconium, which is used in abrasives and insulating materials. It is the source of zirconium oxide, one of the most refractory materials known. Crucibles of the oxide are used to fuse platinum at temperatures in excess of 1,755 °C. In addition, zirconium metal is used in nuclear reactors, based on its neutron absorption properties. Large specimens of zircon are appreciated as gemstones, because their refractive index is relatively high—around 1.95 (by comparison, the refractive index of diamond is around 2.4). The color of zircons that do not have gem quality can be changed by heat treatment. Depending on the amount of heat applied, colorless, blue and golden-yellow zircons can be made. Zircon is regarded as the traditional birthstone for December. The pervasive occurrence of zircon has gained in importance since the discovery of radiometric dating. Zircons contain amounts of uranium and thorium (from 10 parts per million (ppm) up to 1 percent by weight) and can be dated using modern analytical techniques. 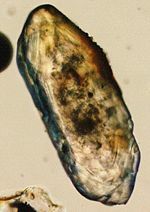 Since zircons have the capability to survive geologic processes like erosion, transport, even high-grade metamorphism, they are used as indicators of protoliths (precursor rocks). 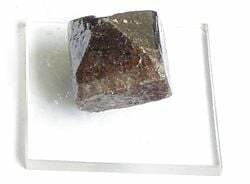 The oldest minerals found so far are zircons from Jack Hills in the Narryer Gneiss Terrane, Yilgarn Craton, Western Australia, with an estimated age of 4.404 billion years. This age is interpreted to be the age of crystallization. These zircons might not only be the oldest minerals on Earth, they also have another interesting feature. Their oxygen isotopic composition has been interpreted to indicate that more than 4.4 billion years ago there was already water on the surface of the Earth. This spectacular interpretation has been published in top scientific journals but is currently the subject of debate. It may be that the oxygen isotopes, and other compositional features (the rare earth elements), record more recent hydrothermal alteration of the zircons rather than the composition of the magma at the time of their original crystallization. ↑ Zircon should not be confused with cubic zirconia, which is zirconium oxide (ZrO2), a different chemical substance that is rare in nature but produced synthetically and used as a diamond simulant. ↑ Metamictization is a natural process by which a mineral's crystal lattice is gradually destroyed, ultimately reducing the mineral to an amorphous form. ↑ Wilde, Simon A., John W. Valley, William H. Peck and Colin M. Graham. 2001. “Evidence from detrital zircons for the existence of continental crust and oceans on the Earth 4.4 Gyr ago.” Nature 409: 175-178. Hanchar, John M. and Paul W. O. Hoskin (eds.). 2003. “Zircon.” Reviews in Mineralogy and Geochemistry 53. Chantilly, VA: Mineralogical Society of America; Geochemical Society. Retrieved April 4, 2007. Valley, John W., William H. Peck, Elizabeth M. King, and Simon A. Wilde. 2002. “A Cool Early Earth.” Geology 30: 251-254. Retrieved April 5, 2007. Wilde, Simon A., John W. Valley, William H. Peck and Colin M. Graham. 2001. “Evidence from detrital zircons for the existence of continental crust and oceans on the Earth 4.4 Gyr ago.” Nature 409: 175-178. Retrieved May 24, 2007. All retrieved July 2, 2013. This page was last modified on 2 July 2013, at 16:10.